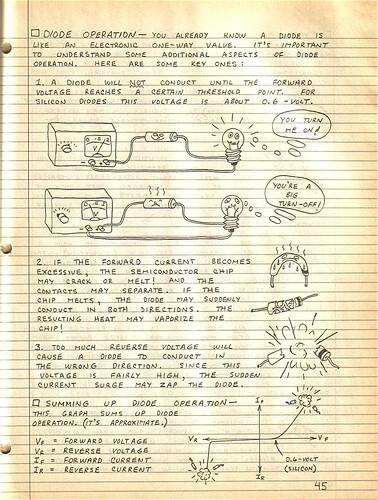 The greatest electronics book ever written? 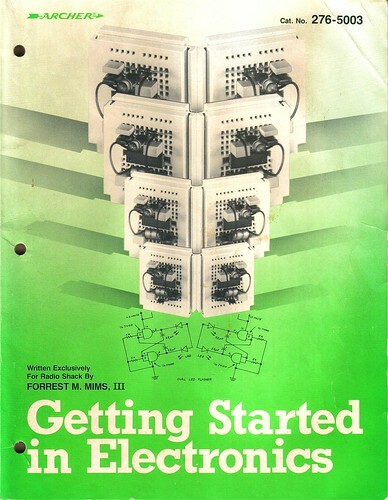 Getting Started in Electronics , by Forrest M. Mims, III. is a spectacular introduction to the world of electronics. This book is not new – the truth is that it has changed little since it’s first release in 1983. Despite this, twenty-five years later, there is really nothing else like it. This book is suitable for beginners of any age yet it comprehensively describes the technical theory and practical use of electronic devices like resistors, capacitors, inductors, diodes, transistors, FETs (including the now-rare JFET), and LEDs, as well as circuits like amplifiers, oscillators, and logic gates. There is even a graphical introduction to device physics (semiconductor materials, doping, electrons and holes) and semiconductor fabrication! This is kind of stuff they teach third-year students in university ECE classes, written in a way that is understandable to a child in third grade! My father gave me this book when I was six or seven years old along with a 25 watt soldering iron from Radio Shack. I am convinced that this book, together with a Science Fair 160-in-ONE kit, is what caused me to pursue a career in Electrical Engineering. I still enjoy leafing through its pages and proving to myself that I can understand how each circuit works. Forrest Mims himself is an interesting individual and has led a prolific career as a writer and amateur scientist. He is an active member of the Society for Amateur Scientists (SAS) and edits the Citizen Scientist. 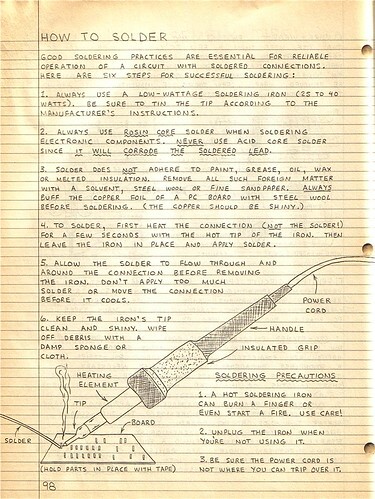 The book even includes a handy guide to help you learn How to Solder! Thankfully, it turns out that this fantastic book is still in print . The groovy green cover is gone (a mistake, in my opinion), but the contents have not changed. This is fantastic news for anyone interested in learning about electronics. These also make great Christmas presents – I bought one for my brother last year and he loved it! In my opinion, this is probably the greatest introductory book about electronics ever written. I’d be curious to hear if anyone has any other favorites – leave a comment if you do! Happy 25th, Getting Started in Electronics! Rest in peace RadioShack after the March 9th chain closing announcement. I had purchased the Mims books as soon as they came to our Local Canadian Radio Shack store in the early 1980’s. (In Canada, the surviving corporate chain called ‘TheSource.ca’ remains open). I attended a lecture by Mr. Mims and I think I have one of the smaller (555 Timers) booklets autographed and signed at that Seminar . I also have a couple of mid-90’s emails in exchange with Forrest, on Climate Science and measurements. How cool is that, these books are still in print! Back far too many years ago, when I knew I was going to be the one to invent the transporter, I started picking up Mims’ books and throwing parts together. I didn’t pursue a career in electronics, but I did develop a lifelong interest in hobby electronics. I’m still breadboarding all kinds of things (and in fact, delivered a light sequencer today that had it’s roots in Mims’ book on the 555) and now getting my grandson interested in the hobby. While I still have many of the Mims books, sadly I lost the green covered one. But how special is it that it’s still available. Oh yeah, I’m buying another one for me, and one for my grandson. Thanks Forrest, thanks very much for your books! Thank You, Forrest. I still own this book from when I was a kid, probably the book I’ve owned the longest, not including my Bible. Wow… this was one of my first books related to learning electronics. It helped me learn the fundamentals. Good ol’ Rat Shack and Forest Mims III’s books. I probably bought every one you wrote. Taught myself electronics using them and the Heathkit Electronics Experimenter courses. Learned troubleshooting from old NavShips Navy manuals. Thank you Forrest, I’ve been dusting them off lately to get back into the enjoyment of building projects just for the sheer fun of it. Never got to be an electronics engineer, but all that knowledge has been of great use for quickly pinpointing problems and keeping things running ever since! Thank you Jeff, for reminding me of something that interfered with my high school social life, or rather kept me busy and out of trouble. You’re very welcome! Thank you for inspiring me and countless other people whose first exposure to electronic design was through your wonderful illustrations and example circuits. -From another electrical engineer inspired at a young age by this book. 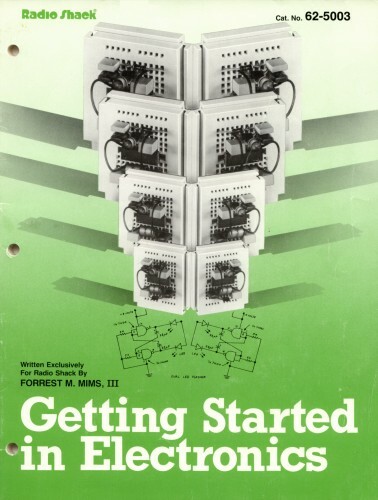 Thanks very much for your kind words about “Getting Started in Electronics.” It has sold more than 1.3 million copies, it’s still selling and I will never forget writing it and building the circuits. I agree fantastic book, too bad about the cover.